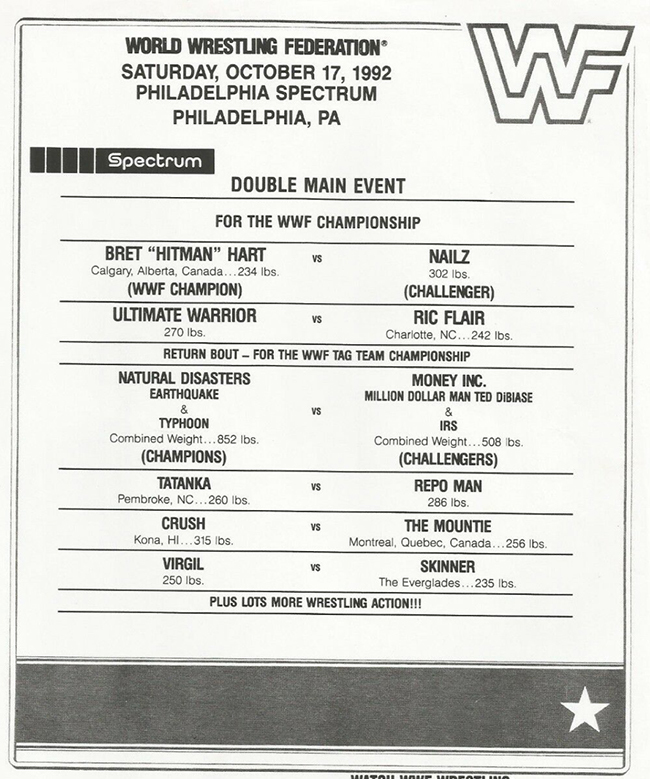 INDUCTION: Old WWF Lineup Cards - You'll Be Glad for These Cards Being Subject to Change! - WrestleCrap - The Very Worst of Pro Wrestling! INDUCTION: Old WWF Lineup Cards – You’ll Be Glad for These Cards Being Subject to Change! Over the years, my passion for professional wrestling has had its peaks and valleys. And I won’t lie – in recent times, it’s been a love on the rocks. There’ve been some cool happenings that have spiked my interest in the last twelve months, no question – the rise of Becky Lynch, the Young Bucks, Cody, and company taking the business in a completely new direction, Starrcast (please pester Conrad on Twitter and tell him to book us! ), and some amazing in-ring action. For every step forward, though, there seems to be a half-dozen steps back, where stuff I never wanted to see again continues to reappear like a horrible rash you just can’t get rid of. Steph, I am looking at you. And I know there ain’t no calamine lotion that will cure that ailment. Recently, though, I was leafing through some old magazine and I found something incredibly cool – the picture at the top of this induction. I see that and I just start smiling. But not just because of that particular card. No, rather it brought me back to the very first wrestling shows I ever attended, and the very first souvenirs I ever purchased: an official WWF Program. In hindsight, those things were rather chintzy – think of a WWF Magazine, but make it like 8 pages. Nothing much to it. Inside was something at first glance of even less value. An 8.5″ x 11″ piece of paper, printed on one just side, in the cheapest manner possible. But what was on there was truly magical. For revealed on that sacred parchment was what you were going to see once the lights dimmed and the bell rang. 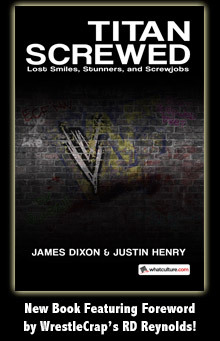 As I noted on the most recent WrestleCrap Radio (click here to join the fun), for me the opening match was usually something involving WrestleCrap inductee Jimmy Jack Funk. If that sounds horrible, well, yeah. It was. But reading on the paper that he was going to be out to battle the likes of Leaping Lanny Poffo somehow, some way, elevated it to must see proportions. Engaged, I started looking for those papers online. I didn’t even know what to Google – oddly enough, “Paper inside WWF Program” didn’t yield the desired result. After about an hour of trying different things, I came up with “WWF lineup card”. And from there, it was on like Killer Khan. 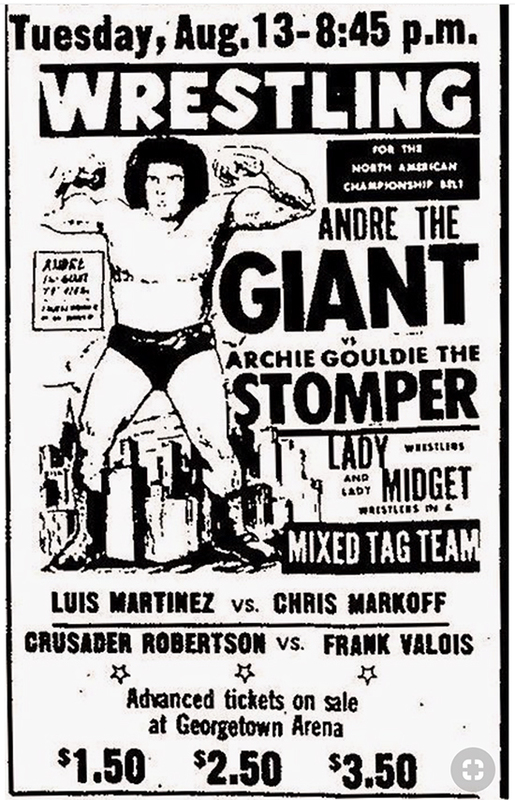 …who could possibly pass up seeing Andre the Giant, a man who apparently was larger than the Empire State Building? And while you may not be familiar with Crusader Robertson (pretty sure that was the guy who would become The Missing Link), the inclusion of Lady Wrestlers…and Lady MIDGET Wrestlers…had to be something to behold!! If all that’s not worth a buck and half, I don’t know what is! It was way more expensive, but seriously…surely you would be willing to pay $8.25 to see Ric Flair…at the local YMCA, right? Especially after Mark Lewin almost became champion last week? And Farmer Boy IPO! That sounds like some unholy mix of a hillbilly with an investment broker. Count me in! Here’s another great one. Man, look at that hair on Ricky Steamboat. By golly that’s almost worth sitting through stuff like Ken Patera vs. Tony Atlas or Dino Bravo versus Greg Valentine! Especially if you’re a senior citizen – you can get in for half price! But this…THIS…is what I always remember and what brought on this induction today. That glossy little program and the card inside. What was waiting for me that evening? Sure, I would know the primary matches – we would get local promos on television. If Hulk Hogan was going to be on the show, he’d for sure be talking about how he was going to swim down the Ohio River, Jack, and crawl out of the water, shake himself dry, then run up that steps at the Riverfront Coliseum to take down Kamala, Dude! Keep in mind – prior to the night of the card, we did not know everything we’d be seeing. That was the magic of the lineup card. One can only imagine the anticipation of young Justin Henry as he came into the Philadelphia Spectrum on December 7, 1985 (no question he’d have been the happiest two-year old in all of Pennsylvania). 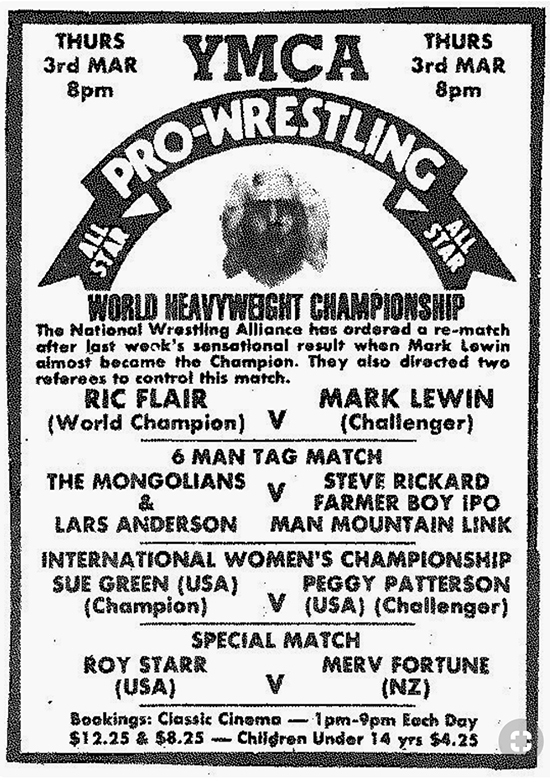 Hogan versus Terry Funk would be a lot of fun, definitely, and Ricky Steamboat was always able to bring out the best in the Magnificent Muraco (even if the guy who typeset that document couldn’t spell the poor guy’s name right). Seeing Randy Savage in his prime would have been great, especially against Tito Santana as those two had insane chemistry. Here’s to hoping they just told their partners to stay on the apron. 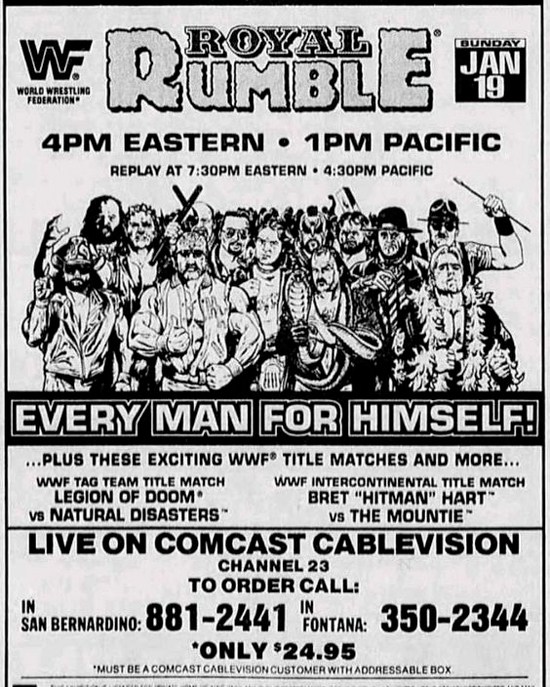 The folks at the Spectrum would also get a preview of a 1990 Royal Rumble match in Lanny (would become the Genius) versus Beefcake and a 1991 SummerSlam match with Valentine versus Mike Rotundo (who would become IRS). Further down the card we would get to see King Tonga. The question for me in that match isn’t if he came to the ring with crown (as would be illustrated on the back cover of the next three years of Apter mags), but if he’d introduce “Iron” Mike Sharpe to the eye wash station. From the “I’m sure glad I didn’t live in Des Moines” file, I present to you this stellar extravaganza. 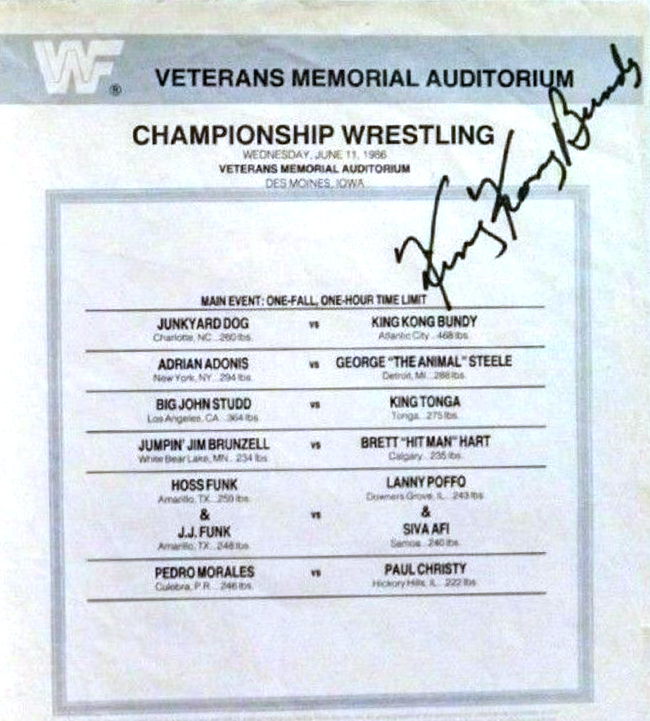 The main event featured King Kong Bundy (who signed this one!) battling Junkyard Dog in what I sure the hell hope didn’t go to the one-hour time limit. Good thing this wasn’t in California, or Dave Meltzer would have had his first negative six-star match. In fact, I can pretty much guarantee our opening contest would have been superior, as Pedro Morales goes one on one with Paul Christy. A wrestler. Magician. Hypnotist. Apartment Building Owner. I bet he had women lined up at Holiday Inn room #214. 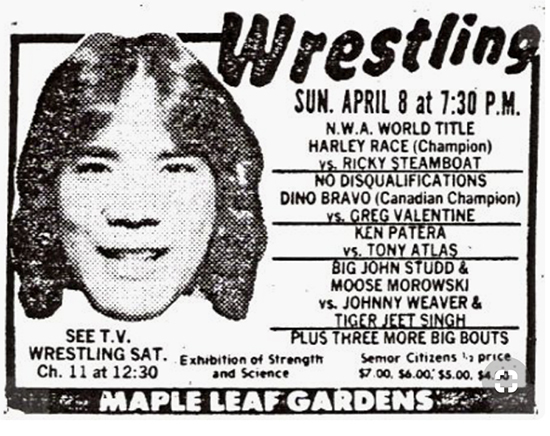 The night of March 17, 1987 was indeed the stuff of legend, as no less than HOSTESS sponsored a night of action at the Newmarket Recreational Complex! Not only did fans get to see The Hart Foundation take on the British Bulldogs, but they got Demolition vs. Danny Spivey and ??????????. The mind spins at who that possibly could have been. I would have said Lanny Poffo, but he was already booked to lose to Ron Bass. I could look it up, but I’ll just say it was Barry Windham. Yes, I know he was in the NWA at the time, but my site, my rules. It is only in this manner that my dream of having the guy who replaced the guy in the US Express tag with the same guy can happen. And holy guacamole…the infamous TOM MAGEE was on this show as well. Man I was I was there to witness the in-ring glory of the man who Vince McMahon legit thought could be the next Hulk Hogan. Last but not least, I have to mention Koko B. Ware versus Danny Davis in a special match. You know how I know it was special? Because the lineup literally says it! SPECIAL MATCH! Three months later, and back we go to Newmarket. Mad props to the person who bought this originally, as that dude went to painstaking detail to ensure I’d have an accurate account of this card for my “Worst of Pro Wrestling” website 32 years later. I don’t even need to do a search to see where Jonny K-9 was from – right there it is! He’s from Romania! In red ink no less! I also see that Killer Khan vs. Sivi Afi was cancelled. Probably a good thing for Sivi, as he was outweighed by exactly 100 pounds. Only thing I can knock this guy for is while he did note that Corporal Kirchner was replaced by Tony Garea, he did not list Garea’s hometown. That or Garea was also from Fort Bragg. I know he isn’t, but in my world from now on he will be. Skipping ahead a few years, fans in Toronto were able to witness a rare Intercontinental title defense by Texas Tornado (Kerry Von Erich), as well as a return match for some reason between the Harts and Rhythm and Blues. That’s kinda a step down from the British Bulldogs to say the very least. What would have been cool though is to see Shane Douglas learning how to fight dirty against the Brooklyn Brawler. I have no doubt it was this exact encounter that planted the seeds in young Shane’s mind to become a nogoodnik himself, which would eventually land him a role as a key player in ECW. Most importantly on this card, though, would be the main event – The Legion of Doom and The Ultimate Warrior versus Demolition. Seriously, what was the deal with the question marks there? Did they think Randy Culley was going to come back as Demolition Pizza Face? Jetting ahead two more years, we dive head first into the WrestleCrap Central – check out the bottom of that card! SKINNER! REPO MAN! MOUNTIE! NEON YELLOW AND PURPLE AND ORANGE CRUSH! TATANKA (BUFFALO)!! Whew, I need a second to regain my breath. But hey, we had Bret Hart AND Ric Flair on the show as well. Not facing each other, mind you – that would have been good. Instead we got Flair versus the Ultimate Warrior (!!) and Bret defending the WWF title versus NAILZ! We got Bret vs. NAILZ. That sounds horrific. But I have to admit – I kinda want to watch it now and see if Bret could pull a rabbit out of his hat. Thinking back upon the Nailz matches I’ve seen, if he got it above DUD level I’d be mighty impressed. You know what? This was kinda fun. And like I said, it rekindled my love for wrestling all over again. Thinking maybe we could do these from time to time as another feature here at WrestleCrap.com – call it “Card Subject to Change”. What do you guys think? Good idea or bad idea? Thanks so much for reading another WrestleCrap induction! We appreciate you doing so. We’d also appreciate your consideration in supporting us on our Patreon by clicking here. For just $2 a month, you will get exclusive content, including the newly relaunched RD & Blade Show. $10? That gets you access to the WrestleCrap Archives! Most importantly, it helps to keep the site alive by paying our hosting bills. Thanks so much and keep on crappin’! Someone Bought This: Triple H- The Early WWF Years! 34 Responses to "INDUCTION: Old WWF Lineup Cards – You’ll Be Glad for These Cards Being Subject to Change!" This isn’t crap. This is awesome! I like the Toronto 1990 one that has a 6 Man Elimination match that is 1 fall. How does that work? I found this on http://www.thehistoryofwwe.com/87.htm. Excellent induction, R.D. I haven’t seen wrestling live since 1991, when I saw Hulk Hogan wrestle Sgt. Slaughter in a Desert Storm match at the Philadelphia Spectrum. I saved the program for many years afterward. It’s a fun thing about going to see wrestling that’s been invalidated by the Internet. And it was fun to see Paul Christy pop up in another entry. Good job! I remember watching one of those matches on one of the Hulkamania compilation VHS tapes that WWF was always putting out. So, yes, one was recorded for posterity. I remember thinking it wasn’t that bad of a Hogan match, because it involved blood. It was better than their WrestleMania 7 main event anyway. The Spectrum 85 card looks amazing. My personal fave card was from a show at the Providence Civic Center back in 89. The first match was listed as having Conquistador II. However, once he got in the ring, he told the announcer (in Spanish of course) that he refused to wrestle unless he was introduced again as Conquistador Numero Uno! Then he proceeded to lose quickly. Can’t remember his opponent, but I definitely remember that luchador in gold – clearly his marketing worked. Love but have mixed feelings about the Akeem siting. Hailing from Deepest, Darkest Africa… previously from Chicago. 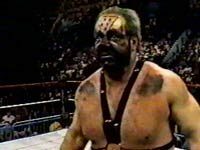 Something back in 1988 made me leary of Slick’s ritual to dub the One Man Gang as Akeem the African Dream. Wonder how it would be viewed in this day and age. Actually I don’t wonder. And I agree about Stephanie. And about peaks and valleys… and about thinking about this when looking at Stephanie. Jeez I can’t believe I went there. Randy Savage felt the same. Think the Demolition bit was to sell the Masked Demolition gimmick. Or Trent Barrett’s came from the future to give them a character tweak. I also remember that even thought these souvenir programs from events were flimsy, and about 1/4 the size of WWF Magazine, that they were so damn expensive. They’d cost like three times what the WWF Magazine cost back then. Maybe I exaggerate, but I somehow doubt it. I would make my grandfather buy me one at every WWF live event we attended. I was just a kid back in the 1980s, but even I knew they were over-priced. That slick cover and those event cards were too cool looking to pass up. How else could I convince the kids at school I really did attend that local arena WWF show? I like this idea, a new recurring column and a fun way to look back at some wrestling history. Lord knows there must be tons of these floating around if you look hard enough, and there’s always the chance of stumbling upon a card from a show you and a fellow Crapper actually attended. I say YES to Card Subject to Change. Incidentally, I’d like to point out the Hostess-sponsored card on St. Patrick’s Day 1987 was on the day my brother was born. I have a DVD copy of The Spectrum show on 12-7-85 from the old Prism Philly network. Also on 12-7-85 there was a house show from The Boston Garden which is on The WWE Network featuring Macho Man vs Ricky Steamboat, Bruno vs Piper, Tito vs The Body and more. Give me a Iron Mike Sharpe-S.D. Jones curtain jerker and my nostalgia veins are gushing. I’d have to disagree with these being crap. It was an awesome idea of knowing who would exactly be facing who that night. The only thing that sucked was the possibility of someone not showing up as advertised. I still have a few from Nassau Coliseum here on LI though the one that stood out for me was one night where not one but 2 of the “main event” wrestlers didn’t show up & instead of substituting 2 other WWF superstars, they just “combined” the 2 main events into 1 between the 2 guys who did show up so we were “treated” to Randy Savage facing Killer Khan. A fun change of pace, RD! Leave it to Steamboat to give us an “exhibition of strength and science” as the card says. Surprised to see the “Special” Koko/Danny Davis match going to a time limit draw. Or maybe the guy meant Koko won by countout? “Card Subject To Change” sounds like it would be subject to awesomeness! Also, I wonder if Lanny Poffo ever corrected the WWF that his hometown was Downers Grove, Illinois, and not “Downer’s Grove”. This was awesome! I’d love to see more like this. loved it. I can remember back in the day early 80’s going to MSG and getting the program and diligently making note of not only the match results but also the time of the decision – when times would be clearly announced. Sadly I never thought to keep any of them or to hang around the Garden and try and get autographs (I was a teen and had a curfew). But one point Dino Bravo (pre- WWE) and Greg Valentines (early 80’s/late 70’s version) were both actually good workers. And Dino was massively over in Canada. That would been early 80’s when Crockett was co-promoting with the Tunneys so it very well could have been a good match. Great induction! I have a bunch of these probably in my parents’ attic. The first card I ever attended was in Buffalo during the summer of ’87. The “card subject to change” thing became very real when Rick Martel teamed up with George “The Animal” Steele! Good times. Those were really cool, and yes, I’d love to see more! Not all that funny, but really interesting and cool. More of this in the future? Yes please! Follow History Of Pro Wrestling on Twitter. They post these all the time. Also I like that it took three tries, but we finally got a card in Toronto that spelled both Bret and Anvil’s names right. 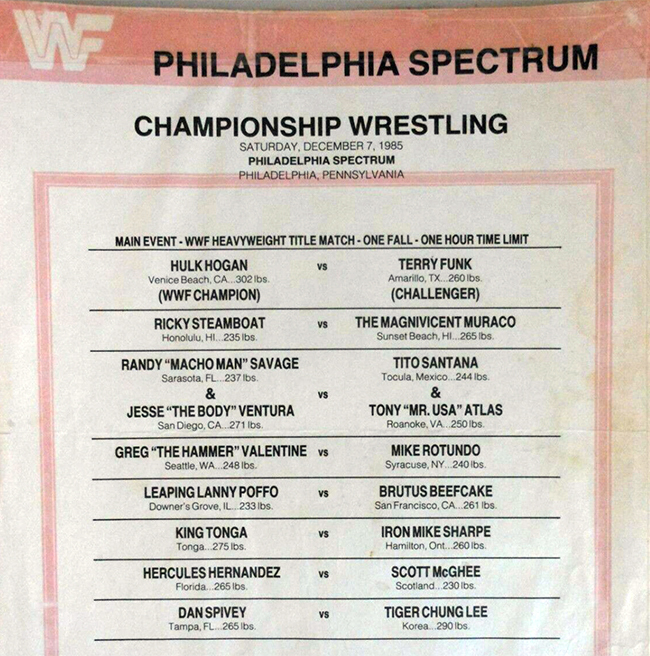 I was at the 1992 Philadelphia card. All matches went as indicated except: Ted Dibiase (w Ric Flair accompanying) vs. Ultimate Warrior. Earthquake pinned I.R.S. (singles match). BONUS MATCH, “Terrific” Terry Taylor pinned Jim Powers. It’s interesting to see how the matches changed over the years, as main event matches moved from house shows to pay per view. I would definitely enjoy this as a running feature of the site! The absolute worst house show I’ve attended was back in 1993 when the main event was: The Bushwhackers & Tiger Jackson (who would later become DINK) vs. Beverly Brothers & some hillbilly midget. That goes to show you how bad business was at that time. The Hillbilly Midget was Little Louie I believe. That’s right! It’s hard to forget Wrestlecrap like that. Little Louie was basically stuck wrestling Tiger Jackson when he was part of the Bushwhackers, dressed up as Mini Macho Man, and ultimately became Dink. The fact Tatanka (Buffalo) is still going after ALL THESE YEARS makes me very happy. These lineups cards was one of the things that I looked forward to the most going to a house show. 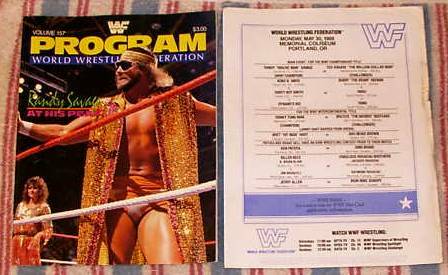 Buy the program and see what matches were on the card for the night. I always remember there to be changes to the card, made me wonder how far in advance these were printed. I’d be interested to see how a one-fall elimination tag went down. I still have all of the lineup cards all of the house shows, TV tapings and pay per views I attended throughout my teen years! Super proud of ’em. The best/worst house show I ever attended was the day I was supposed to see Kerry von Eric vs Curt Hennig – and neither showed up, so the match became Ko Ko B. Ware vs Greg Valentine. There were so many cancellations on that card I saw Greg wrestle three times that night. Hope he got a great pay-off! It Came From YouTube: Blade Braxton’s Double Ice Bucket Challenge! Why does Blade need TWO buckets? Are you sure you want to know? Oh…and donate today! !